Love in its purest form is often accompanied by anguish and sorrow, for happiness is sweeter at the end of the anguish. 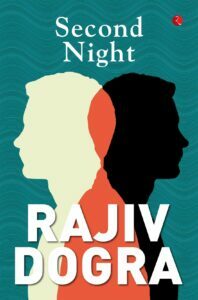 ‘Second Night’ by Rajiv Dogra is addictive and intense. It is a storehouse of emotions. The story oscillates between present and past, eventually shaping up the future of the characters. Terse narrative and the succinct plot make this an enjoyable reading experience. The story begins with the love story of Sat-Sati in college. Love knows no bounds, for their hearts are pure. After being hoodwinked by the circumstances, Sat retreats into solitude after Sati leaves him for no solid reason in particular. However, life goes on and a time comes when Sat decides to visit his beloved Mrs Keeling who is like a motherly figure for him. Under the shadow of unforeseen events, Sat reunites with his best friends Shiv and Shyam. Reminiscing the days of their college life, the trio spends the second night in Mussoorie unearthing layers of pain in their heart. While Shiv is unsure if he believes in love anymore, Sat declares that his heart only beats for Sati and no one else. The author’s prowess to capture the earnest-yet-awkward cadence of adulthood is something to look forward to in this book. He explores the pathos of relationships like friendship, love, parental love and love between siblings. While the central love pair is nicely rendered, the character sketch of Sati lacks the lustre. Failure to build up her character makes her reasons complex and irrational. A similar problem arises when Shyam and Shiv’s relationship with Mrs Keeling is kept under the wraps because it does not allow the readers to comprehend the intensity of the bond shared between them. Certain chapters are perplexing because their relevance cannot be understood. Nevertheless, the story is a beautiful testimony to the enduring power of love. Appearances are deceptive and ‘Second Night’ capitalizes on this proverb not only through its blurb but also through the characters of Shyam and Shiv. Overall, ‘Second Night’ is a fast-paced gripping story that is sure to leave you charmed.